Slowly whisk in the whipped cream with condensed milk. 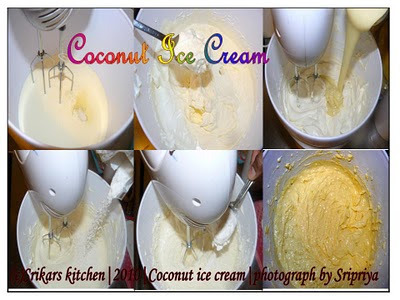 Add in the dessicated coconut & the custard powder to make a soft mix. Freeze it & serve cold. Tomorrow is Karadaya Nombu which is very sacred for tamilians.For full details click here. 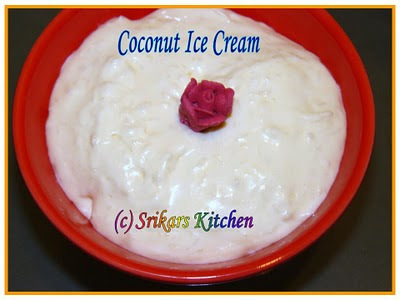 Your coconut ice cream looks yummy.. Love to get my hands into it..
Congratulations on ur 200th post!!! Coconut Icecream Sounds new to me. Srimati..happy Mother's Day, wishing u many many more lovely posts! Congrats on 2nd century! :D Unique ice cream..shall try ..bookmarked! Congrats on the milestone and that is a very creamy icecream. Txs for ur lovely comments & Happy mother's Day to All !! Congrats on your 200th post and happy mother's day! I did not know it was today. Congrats on our 200th post and Happy Mother's Day. Icecream looks fantastic and yummy. Congragulations on the 200th post. Happy Mothers day. Here mothers day is in May. I know in UK it is much earlier than for us. 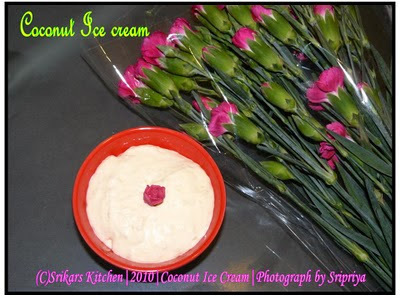 Happy Mother's day and delicious flavored ice cream! This is so unique..sounds delicious! hey congrats!! icecream looks great.